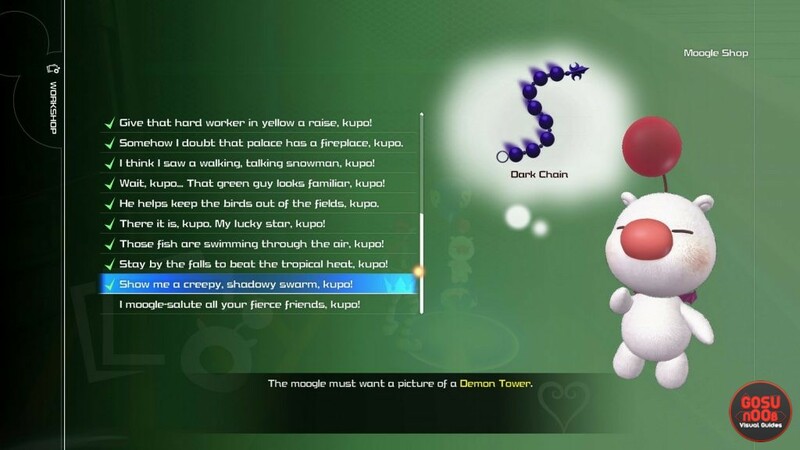 Demon Tower Photo Mission in Kingdom Hearts 3 is a side quest you can get from the Moogle. To complete the KH3 Demon Tower Photo Mission, you have to take a photo of, well, a Demon Tower. To do that, you have to know where to find a Demon Tower location in Kingdom Hearts 3. Turns out, in order to find one, you have to access a specific Battlegate in the late game. TO save you the hassle, here’s our Kingdom Hearts 3 Where to Find Demon Tower Photo Mission guide to help you solve the task as easily as possible. How to Complete Kingdom Hearts 3 Demon Tower Photo Mission – Where to Find? To find and complete the Demon Tower Photo Mission in Kingdom Hearts 3, you’ll have to find a specific battle gate in Monstropolis. For more information on Battlegates, check out our Battlegates Locations – Where to Find Battle Portals guide. Anyway, start from the Door Vault Service Area, and head east through the huge corridor. On the other side, follow the path forward and to the left. Climb up the metal wall, and then walk through the huge, gaping hole in a tank in the Tank Yard. Interact with the blue object to open Battlegate 8. Prepare for trouble. So, now comes the tricky part – taking the actual photo. When you star the battle, the Demon Tower will sprout out of the ground, and there will be some adds to deal with, as well. You’re gonna have to center the camera on the Demon Tower as much as possible, and get as much of it into the frame as you can. The problem is that the Tower doesn’t stay stationary for long. A possibly good approach is to dodge an attack, then try to get the photo as fast as possible. You might need to try several times, but you’ll get it eventually. Take a look at the second image above to see what our successful Demon Tower photo ended up looking like. That’s all there is to it, really. If you’re having trouble with some other photo missions, check out some of our other guides on the subject. For example, we have Big Beasts & Bugs Wall Display Location, Water Core & Flame Core Photo Mission, and Festival Picture Photo Mission – How to Complete. There is no blue wall just a hole where the wall should be. When or how do i get the wall put wjere the hole is. Do i have to beat the entire game first? Ove beaten every world got all the collectables and i am lost. This shouldnt be this difficult. Help! Just to be clear, I didn’t say blue wall, I said blue object behind a destroyed wall. So, you’re in the right place. However, you do have to beat the game before the battlegates start spawning.